Camping this past weekend, I was struck by how much trash is generated when drinking beer in the great outdoors. While Coloradans are better than many when it comes to packing it in and out, you can still see beer cans, bottle caps, pull tabs, and bits of labels littering campsites across the state. And – even though you can now purchase pretty much any style of beer in a can – you’d think people went camping just to smash bottles judging by the shards of glass strewn everywhere. Is it somewhat annoying to haul your empty cans/bottles out of the woods? Do the last few drops of skunky beer always manage to get your gear sticky and smelly? Yes and yes, but there’s still no excuse for leaving evidence of your wilderness imbibing. If you’re interested in exploring a post-can world, there are several options out there that will allow you to drink craft beer outside. The Hydroflask – available at many fine breweries around Denver – will keep your beer fresh + cold for up to 24 hours and comes in 32 and 64 ounce versions. Need more than 64 ounces of beer? Try the ManCan, a personal keg system that can keep up to one gallon of beer “fresh, carbonated and delicious”. 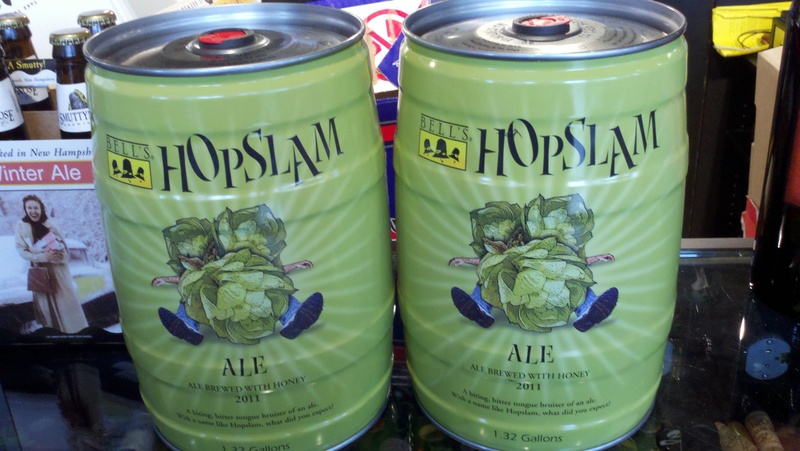 You can also find certain beers in multi-liter mini-keg form. Some varieties are better than others. Crooked Stave – known for their wild ales – taps the cheekily named Sourless IPA as part of their regular Tuesday release series. The 6% ABV American-style IPA is brewed for summer and hopped with Azacca, Galaxy, Amarillo, Centennial, Citra, and Comet hops. Dunbar is throwing a summer BBQ series, featuring a new brewery each Wednesday. They kick things off this week with Dad & Dude’s Breweria and their Dank IPA; Pineapple Express, a honey blonde brewed with pineapple puree; and Peachy Keen, a Peach Berliner Weisse that “screams summer”. $20 gets you a plate of homemade BBQ and two drafts of the featured beers. A carriage house is an off-shoot of a main house just as the “The Carriage House Series” is an off-shoot of Call to Arms’ regular slate of releases, unveiled as a precursor to the brewery’s Super Awesome Anniversary FunFest this Saturday. The series will give light to wild, sour, and barrel-aged beers. The first, Yu Zu Yu, is a wild saison blended with yuzu – an Asian citrus fruit believed to be a hybrid of sour mandarin and Ichang papeda (knowledge is power!) – and raspberries then aged in Chardonnay barrels. It’s hopped with Bravo, Hull Melon, and Nelson Sauvin and the malt bill features Pilsner, White Wheat, and Acidulated grains. Packaged in 375mL bottles, there are only 50 available. Limit 2 per customer and a finite amount will be available on draft. Friday, July 15, 2016 @ noon – 10pm: Gold Fest Bottle Release at Tivoli Brewing Co.
Gold was discovered in Colorado back in 1850, prompting many a prospector to cut short their California-bound wagons and set up shop in the then unorganized territory. The original Tivoli brewery was built not much later in 1864. The newly revived Tivoli Brewing Co. is celebrating the discovery of gold in them thar hills with the release of a bottled version of their 5.1% ABV Tivoli Helles. Come enjoy some live music, historic brews, patio games, and enter to win Tivoli beer for life. $10 general entry. Edgewater’s premier brewery, Joyride, is celebrating its second anniversary with a full-on block party. There will be live music from FU^k, K-Law, Johnny Tarr, Muriel and the Deano’s, and Whillis. Special releases and tappings include 2015 Boxer Saison, 2015 Belgian Strong Dark…Side of the Moon with tart cherries, 2015 Wolf Wrestler Wee Heavy, and the 2016 Bourbon Barrel Aged Tour Time Barleywine. Additional activities include dunk-the-brewer, bouncy castles, face painting, and food trucks. No cover. Get an early start on the beer-drinking day with Alpine Dog and Spudz food truck. The former will be releasing Java McHoppy Face, a coffee pale ale, and the latter will be serving up breakfast poutine. And for an extra buck, the first 100 peeps who buy a java brew can walk out with an Alpine Dog-branded coffee mug. Take an informational tour of Laws Whiskey House and hang with the people behind the booze. They’ll be serving $5 bourbon cocktails, $5 whiskey pours, and a $10 flight that includes 4 Grain Bourbon, Farmer’s Select Single Barrel and a surprise rye whiskey. $2.50 tacos from True West will also be available.